Portable sawmilling, joinery services and timber sales. WoodyOne has two portable sawmills and can travel to your place, to mill your trees on your site. WoodyOne also has a fully equipped woodworking workshop to create custom doors, windows, stairs, floors, cabinetry and furniture from natural, durable and sustainable timbers. We have a stock of timber available and can supply hardwood and softwoods generally to order. We can also source other timber from other foresters or millers. WoodyOne has wood flooring available in 3,4,6 and 8 inch in Eucalyptus Saligna and Eucalyptus Botryoides. These Eucalypts produce a pink/red wood, are a hardwood and well suited to flooring. Other available timber species include Acacia Melanoxylon (Blackwood), Eucalyptus Pilularis (Blackbutt), Eucalyptus Microcorys (Tallowwood), Cupressus Lusitanica (closely related to Macrocarpa), Maples, Oaks, Planes and others. 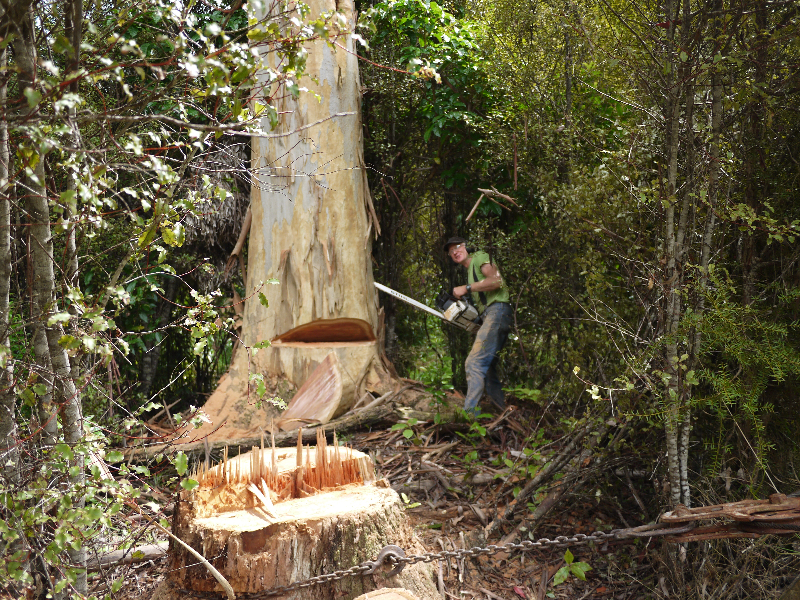 WoodyOne is located near Warkworth and is available for portable sawmilling anywhere from Auckland city to Kaiwaka. WoodyOne operates two different sorts of mobile or portable sawmills. We have a 10-inch Peterson swing blade suitable for large old trees/logs that are difficult to move. The other is a Wood-Mizer band saw which offers higher yields especially in small diameter logs. This means you can have your trees logged and sawn on your own property. 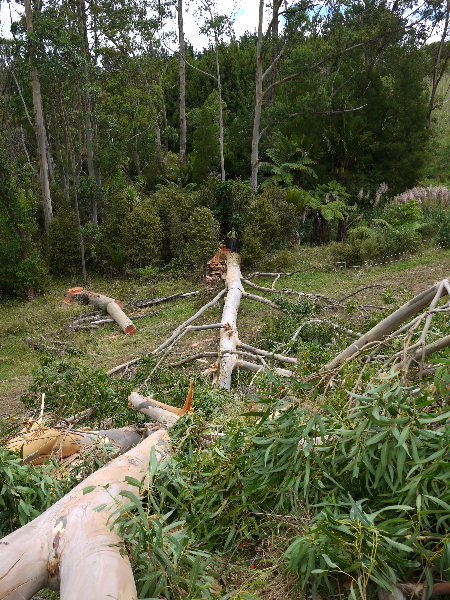 We will harvest your trees with minimum impact to the surrounding environment. WoodyOne will also trade portable sawmilling services in exchange for wood, dependent on the timber type. 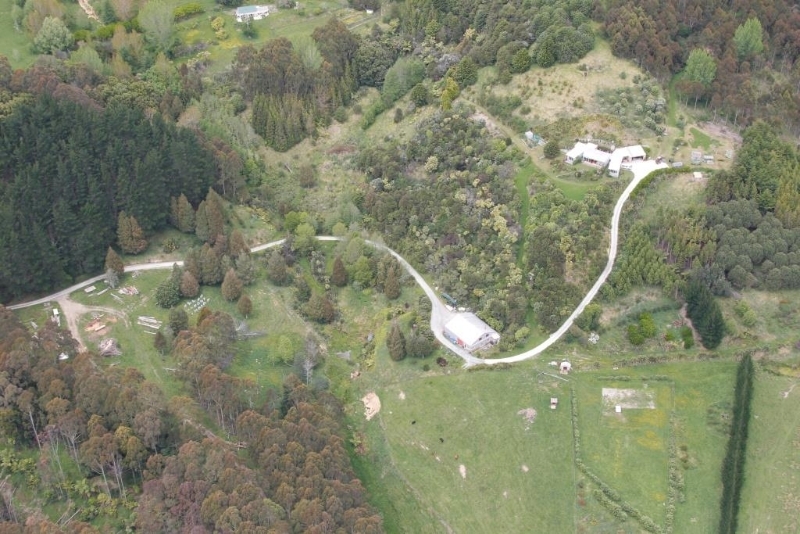 Located approximately 15 minutes from Warkworth, Puhoi and Kaukapakapa and roughly one hour north of Auckland, WoodyOne’s forest covers two thirds of what is known locally as a life sentence block. The forest consists mainly of Eucalyptus species – Botryoides, Saligna, Pilularis with some Globoidea and Microcorys. In addition to the main forest there is a joint venture block (with forest research) which includes approximately 30 varieties of the stringy bark sub group of Eucalyptus; three varieties of Cupressus, several Acacias, Poplars, Redwoods, Casuarinas, Alders, Robinia, Grevilli and Totara as the primary native species. Some sections of the forest are being thinned out and are yielding small saw logs, which are being milled for use as linings and sarking (under the shingles of a roof to provide support). No matter what your joinery and carpentry requirements, put it in the hands of the experts at WoodyOne. Operating from our own fully equipped workshops all our items are made from the highest quality timber and are sourced from sustainably managed forests. John Furniss (WoodyOne Business owner) is available for consulting. He provides valuable, experienced and realistic advice on forest planning, species selection, silviculture and harvesting. A variety of timber species of various sizes and grades are available for sale. Various other species are also available for sale from time to time. Contact us to talk about your timber needs.